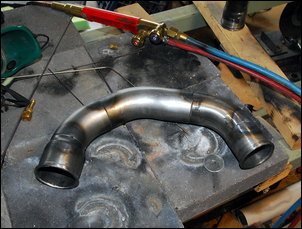 Back in DIY Intercooler Plumbing we looked at how you can build your own intercooler plumbing at home. 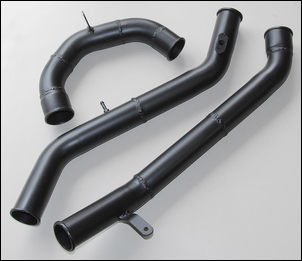 Of the different methods we covered in that story, my favourite is welding together steel mandrel exhaust bends – it is cheap, gives strong plumbing with excellent flow, and can be fitted into most cars. In this story we’re going to look at tips and tricks associated with that type of approach. Yes you need a welder of some description (here I use an oxy acetylene set-up and fusion welded the tubes together) but welders are extraordinarily useful in lots of areas of car modification – so if you haven’t got one, they’re worth buying! Rather than do a set-by-step, let’s take a look at some tips you can apply to any car. 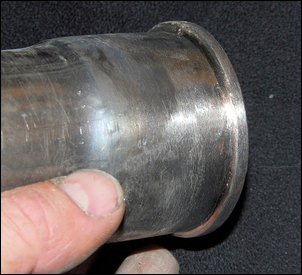 In most intercooler plumbing there’s a need for some type of size adaptors – you know, from 2½ inch to 3 inch, or from 2 inch to 2¼ inch. 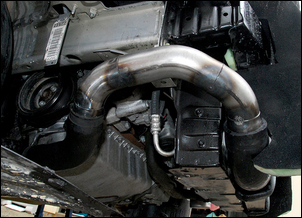 A very cheap way of making these is to have an exhaust shop expand up some exhaust tube. 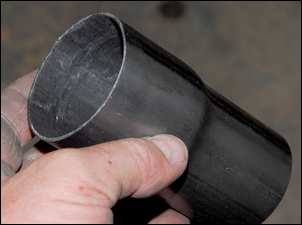 The adaptor shown here takes the pipe size from 2 inch to 2¼ inch – about as much expansion as can be achieved in one step. But if a larger step is required, there’s no drama in then having the next pipe size up expanded. So for example, if you need to go from 2 inch to 2½ inch, get one adaptor made that goes from 2 inch to 2 ¼ inch, and then another that goes from 2¼ inch to 2½ inch. 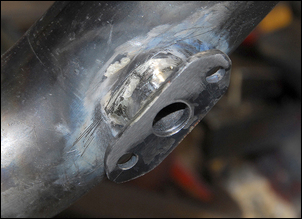 You can then cut and weld the adaptors so that they flow from 2 inch to 2½ inch. However, when dealing with these adaptors be careful. 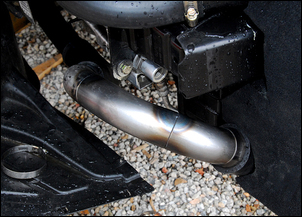 Exhaust tube has a seam and, when expanded, the tube can split along the seam. In this case the split was easily welded shut. The adaptor shown above was made at no cost – I was buying some mandrel bends and the exhaust shop threw the adaptor in for nothing. All intercooler plumbing should have lipped ends to prevent hoses sliding off. The hose clamps should only be tight enough to stop leaks, and the force of the hose blowing off should be withstood by the clamp having to get past the lip. 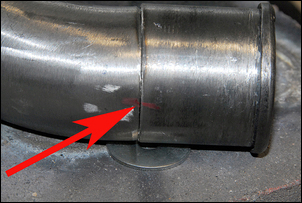 Some people run a bead of weld around the end of the pipe (or even just put a few spots of weld around the tube end) but a much neater job can be obtained by taking the following approach. You’ll need some thick wire (or thin steel rod). I used these 4mm diameter steel tent pegs that were cheap and readily available. 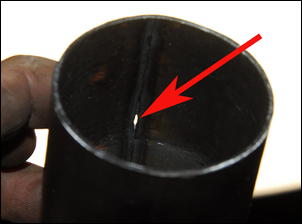 Using a hammer, the wire was then bent around a bar that matched the diameter of the intercooler plumbing (in this case, 2 inch). Here is the tent peg formed to the shape of the tube. You may need to use two half tent pegs, or if you are using rod or wire that is long enough, obviously just the one piece can be used. Before welding I heat the wire to rid it of its plating. The wire is then welded into place, with the bead running around the lip of the tube. 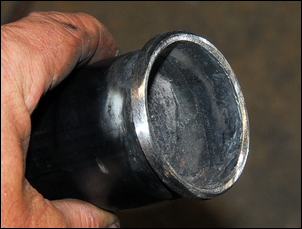 Ground back with a grinding wheel or belt sander, a regular and effective lip is formed on the end of the tube. A few important points should be kept in mind when joining the tubes. Don’t try to cut the tubes with a hacksaw – it is nearly impossible to make square, straight cuts and so trying to join up plumbing cut with a hacksaw is a nightmare. 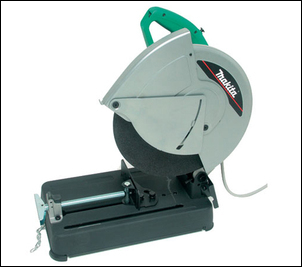 Instead use a friction saw – these are now available very cheaply. 1) The tube diameters and shapes are the same either side of the joins (even on mandrel bends the tube cross-section changes a little on the bend). 2) There are no internal bumps or discontinuities on the bends where the flow is having to change direction. 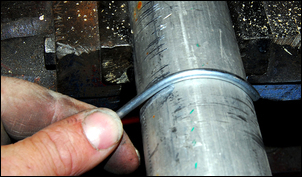 When assembling the tube, always mark across the join (red arrow above) and then make sure the marks exactly line up before tacking the pieces together. Note also the supporting washer under the join that helps to align the tubes before tacking. 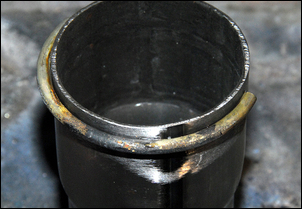 Here note three things: on this tacked assembly the lipped ends have already been welded into place and then ground back; the change in size provided by the adaptor located at the left-hand end; and the fact that no joins are placed on bends. Here is the same assembly trial fitted to the car. 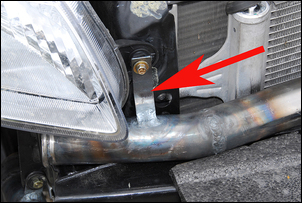 Note that the pipe sections are still held together only with tacks – if changes need to be made, the tacks can be easily cut. The same assembly photographed from under the car. This is the time to look very carefully, ensuring the pipe will not foul anything (eg with the bumper cover back on) and that no rubber hoses or bends are being twisted, bent or pulled out of their natural shapes by the steel tube. The intercooler plumbing must be designed to allow the engine to move (it vibrates, and rotates around its mounts when the clutch is engaged) and also allow the intercooler and plumbing to expand and contract a little with heating and cooling. However, the plumbing must also be secured so it cannot bang into (or vibrate against) bodywork. 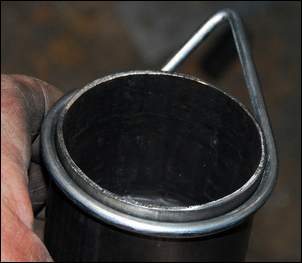 Here a bracket has been used to hold one end of a section of plumbing. 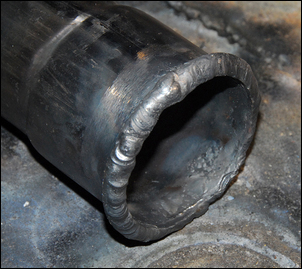 Be wary of grinding back welds on intercooler plumbing made from mandrel steel exhaust pipe bends. 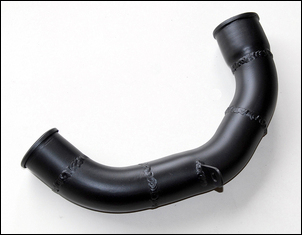 Yes you can make the pipe look like one continuous length of tube – but it’s also dead easy to reduce wall thickness to the point where the tube breaks in service or even fails under boost. I now choose not to grind back any welds (except at the tube lips). 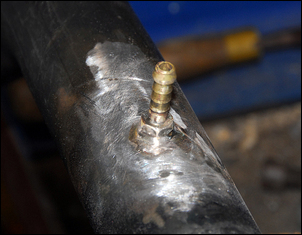 If a boost pressure fitting is needed (or even two boost pressure fittings - one each side of the intercooler), it’s easy to braze or silver solder a brass hose fitting to the tube. Making fittings to take factory temp or pressure sensors is also straightforward. The finished plumbing. Note the lack of sharp bends (the sharpest used was 45 degrees), the brackets, pressure fitting, factory temperature mount, and size adaptors. The end result was cheap to make, flows well and is strong.